A good natured man thrust into the horror of the apocalypse, Travis Manawa does whatever he can to keep his family safe. His good nature and belief that everything can be fixed with a little work, is challenged when existence becomes a savage and constant fight for life and death. A man trying to constantly cling to his humanity, is forced to not only watch his family start to lose theirs, but has to go against all his morals or else they all will die. 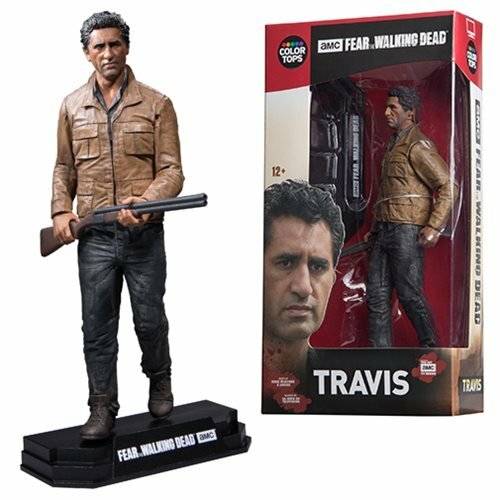 This Fear the Walking Dead Travis Manawa 7-Inch Action Figure features Travis in his outfit based on season one of AMC's Fear the Walking Dead, and includes Daniel Salazar's shotgun, as well as a stylized display base! Figure stands about 7-inches tall, features multiple points of articulation, and comes packaged in a numbered, collection-friendly window box. Ages 12 and up.